I got a new Simon Says Card kit and decided to work ahead and make my hubby’s anniversary card early! Our anniversary isn’t until November 25th so I am way, way ahead! I always remember the anniversary and we make plans but I forget about the card until the very last second. And if you know me, you know that I NEVER make things until the last minute. I added a red heart for each member of our family. I accidentally cut the patterned paper too short so that’s why the banner is at the bottom. I know it isn’t that balanced but hubby won’t mind 🙂 I should have cut the DP and placed the gap behind the banner but for some reason I didn’t think of that ‘til now. Next postMy First Unscripted Sketches Post as a DT Member! 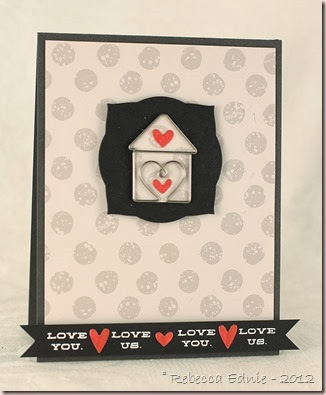 Love the bold black with wee little hearts!! Super sweet!I am so glad to have been added to the DT at US! I can't wait to get to know you all more and get so acquainted with all of your lovely styles! !Hugz!